Around here there is no shortage of love for scones. Just check out all our scone recipes! We love that they can be made in so many different ways, from savory to sweet or even spicy. 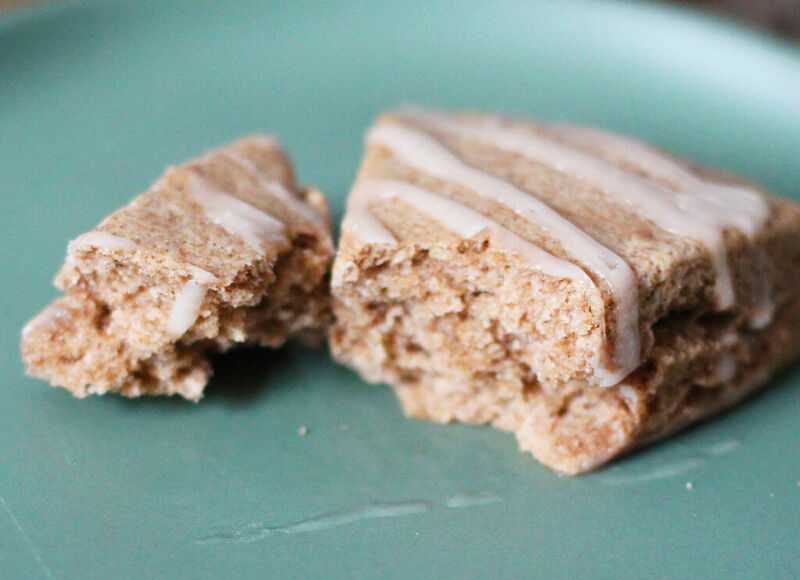 Once in a while we even like to make them a bit more on the healthy side, like with these vegan banana oat scones. 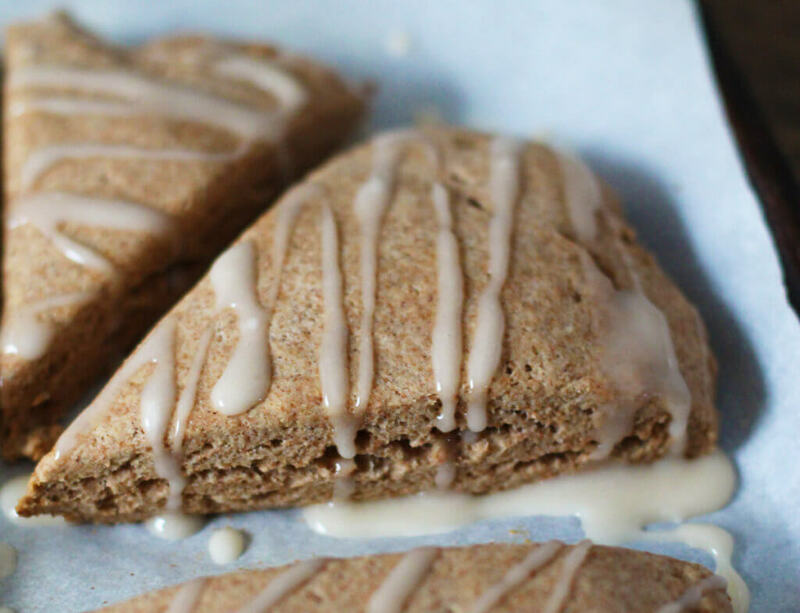 These vegan banana oat scones are made with a combination of whole wheat and oat flours which gives them a really unique texture and flavor. Additionally, we avoided processed sugar by sweetening them with maple syrup instead of traditional sugar. We went dairy free by using coconut oil, however if this isn’t a concern for you, feel free to use regular butter instead. Similarly with the almond milk; it is perfectly fine to swap it for your milk of choice, just be sure it is unflavored as using a flavored milk could alter the final taste of the scones unintentionally. Granted, there is a sugary glaze atop these babies, but you can just as easily swap it out for something healthier or skip it all together. The beauty of this recipe also is that it’s very basic, leaving you, the chef, with the power to dress these scones up as you please. Feeling fruity? Why not add some berries or apples to the dough? Want to go a little nuts? Add those in too! You can even swap out the sugary glaze for a nut butter drizzle instead. Nut butter drizzles just consist of any old nut butter combined with a little oil to thin it enough to drizzle. This is an especially great idea if you decide to add nuts in the scones as it will help balance out the flavors and textures. These scones do come out a bit dry, so having some kind of glaze is important. 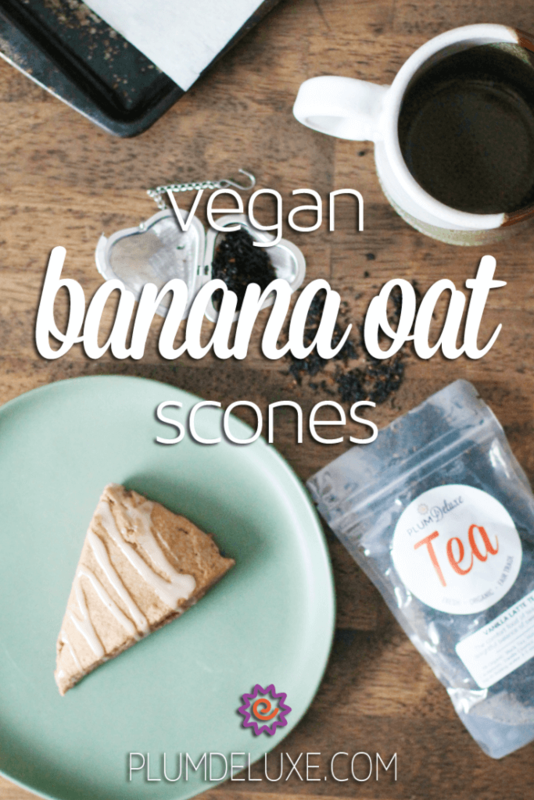 Since these vegan banana oat scones are fairly simple without much embellishment, they are very versatile when it comes to pairing them with other foods or teas. 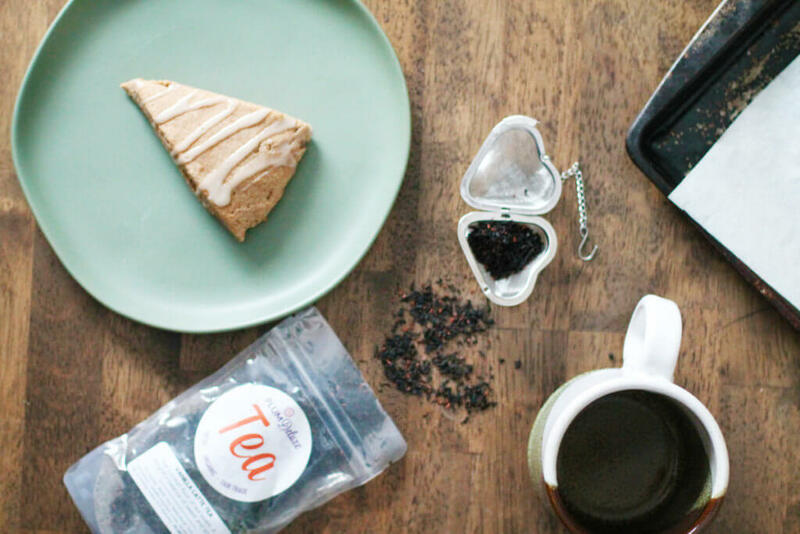 We suggest trying out our Apple Cinnamon Warmth black tea or our Porch Sippin’ Pecan tea, which is especially good if you add a few toasted pecans to the dough. My personal favorite is the Vanilla Latte tea and the scones made in their simplest form. It’s simply such a comforting combination. In a medium mixing bowl, sift together the flour, baking powder, cinnamon, ginger, and salt. In a small bowl, combine the mashed banana, almond milk, 2 tablespoons of maple syrup, and 1/2 teaspoon of vanilla extract until well combined. Pour the banana mixture into the dry ingredients and stir to combine. It may take a while to combine completely, but it will eventually. Do not add more liquid. Turn the dough out onto a flat surface and use your hands to form the dough into a large circle, about one inch thick. Cut the dough round into roughly 8 equal slices. Transfer the slices to a parchment-lined baking sheet so that they are not touching. Place in the oven and bake for 15-17 minutes or until lightly golden brown. Remove from heat and let stand until cooled slightly. While the scones cool, whisk together the 1/4 cup of maple syrup, 1/2 teaspoon of vanilla extract, and powdered sugar in a small bowl until incorporated. Once the scones have cooled, drizzle the glaze on as desired and serve.